Looking for Benjamin Franklin? Barry Stevens is available to portray Philadelphia's most famous citizen and add life, liberty, happiness and a bit of history to your next event. Please visit my website: email:, phone: 703-851-2443. Ben Franklin draws a crowd every time! Our company has hired Ben Franklin by Barry Stevens three times in the past 18 months to support us in national tradeshow events. Ben consistently draws a huge crowd and is extremely engaging with our prospects while always remaining in character. During quiet moments at our booth, Ben wanders out in the aisles and solicits attendees to visit with us. While I attend many tradeshows in the course of a year as an exhibitor, I have never seen a phenomenon quite like this and he has become a rock star in our world! 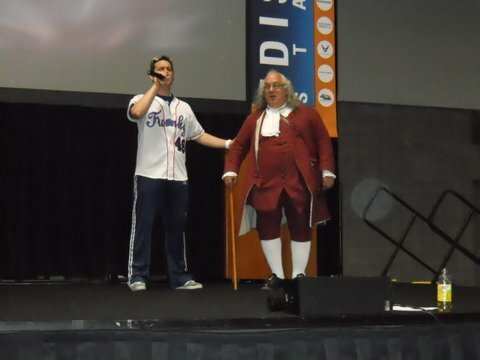 A neighboring exhibitor at our most recent event at the Philadelphia Convention Center approached me at the end of a 3 day show to thank me for all of the booth traffic that spilled over to his booth because of Ben Franklin! 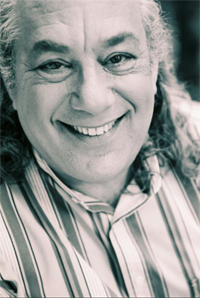 Ben Franklin by Barry Stevens is an amazing personality and we will call on him again. Ben is absolutely the BEST! 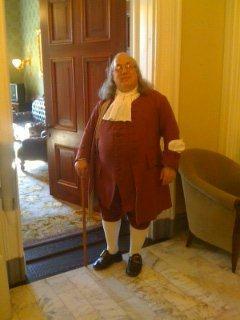 This is the second time our company has hired Ben Franklin (Barry) for our trade show events. Ben not only poses for pictures he works the crowds like no other. He pulls people in off the aisles with his personality and they love him! We had more leads than booths three times our size and we had lines to come into our booth to see Ben. After three days our lines were still as strong as day one. If we can use Ben again we certainly will. He is a people magnet and has a wonderful presence. Thank You Ben! Thank you very much Stacy. It is a pleasure working with you and the crew at the booth. We asked Benjamin Franklin to be the entertainment for my Father-In-Law's 100th Birthday celebration. We asked Ben to give a short talk, a toast, and lead the singing of Happy Birthday as the cake was brought in. Looking like Benjamin Franklin in dress and manner, Barry graciously and humorously made us feel that we were back in Colonial times. Our 50+ guests thoroughly enjoys him and wanted to know how we had found him! Thank you, Barry!